Up until now, Nvidia has been treating ray tracing as an exclusive feature available only to its Turing RTX graphics cards, but now the company is suddenly enabling it on graphics cards as low-end as a GeForce GTX 1060. 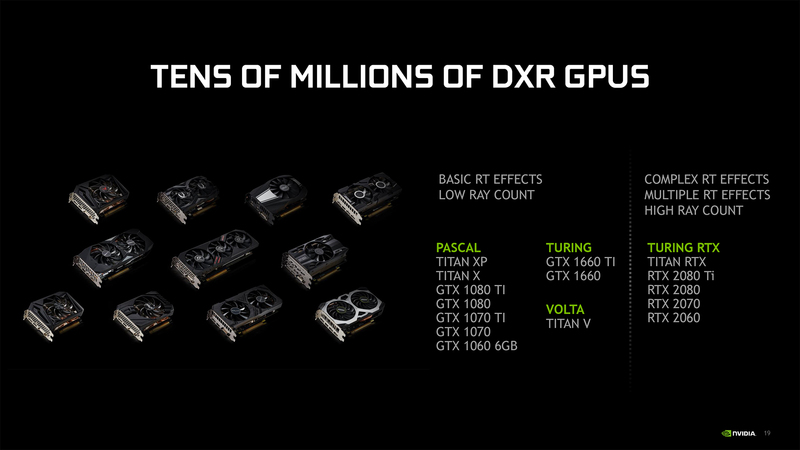 On the first day of GDC 2019, Nvidia announced that it will introduce a driver in April that will enable both Pascal and Turing GTX graphics cards to render ray tracing effects using DirectX Raytracing (DXR). The list of supported graphics cards includes both the recently introduced GeForce GTX 1660 Ti and GTX 1660 as well as everything in between a GTX 1060 (6GB) and Titan X. These Turing and Pascal GTX cards will be able to handle games running with basic RT effects and a low ray count – or, in other words, RTX Low settings – though your mileage may vary with the titles you play. In our briefing, we were told Battlefield V should run well on most cards and at RTX Medium to High settings due to the game primarily rendering only ray traced-reflections. Meanwhile, certain shadow heavy scenes in Shadow of the Tomb Raider (which still has yet to receive its RTX and DLSS patch) could bog down your GPU. Metro Exodus is the most punishing of the bunch as it uses ray tracing technology to power its global illumination engine. Nvidia stresses users would see the best experience with an RTX graphics card. According to Nvidia, ray tracing coming to GTX cards was always on its roadmap. However, this statement seems in direct opposition to all of the company’s marketing and figures that previously said ray tracing could never be done on a traditional GPU without dedicated RT Cores. If anything, it seems like Nvidia is trying to get ahead of the possibility that next-generation consoles – the PS5 and Xbox Two – might feature ray tracing. Nvidia would be in a tight spot if these future consoles could render games with DXR and its high-end, albeit previous generation, graphics cards couldn’t. In a smaller, related note, Nvidia also announced that it is introducing DXR into the Unreal Engine and Unity. With ray tracing technology being integrated into the two major game engines that powers 90% of the games in the world, we’ll likely (or hope) to see more ray traced-games in the near future. Will Intel Graphics Cards support ray tracing out of the gate?